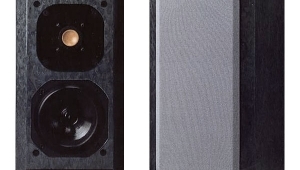 As far as I can tell, Santa Fe–based speaker engineer John Bau had designed but four commercial loudspeakers before the TC-60 was launched at the 1994 Winter CES: in order of appearance, they were the Spica SC50i (1980), the TC-50 (1983), the Angelus (1987), and the SC-30 (1989). 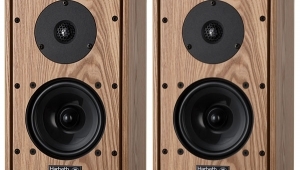 None were expensive, and all garnered much praise, both in Stereophile's pages and elsewhere. 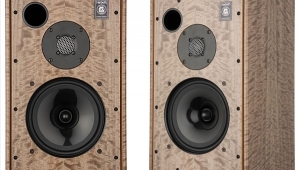 Why, then, wasn't Spica one of the most successful speaker manufacturers in the land? Partly the blame must be laid at the feet of the speakers: the one thing none of them did was rock out at party levels. 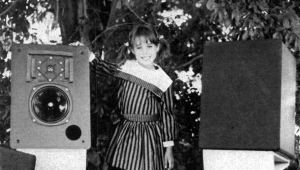 But mostly, the Spica company's marketing expertise lagged way behind the quality of the speakers. So when the company was purchased just over a year ago by Parasound, with John Bau to stay on as president and head of engineering, Spica's future looked considerably more promising. It's not just that Richard Schram, president of Parasound, could sell snow to Alaskans—heck, he could sell them the freezers to keep it in—but that John Bau's engineering efforts could get better focus in terms of feedback from the market and essential financial support. 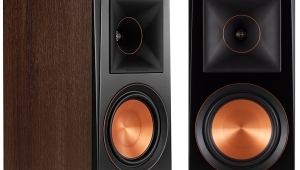 The two-way TC-60 ($795/pair) is the first speaker to come from the revitalized Spica. 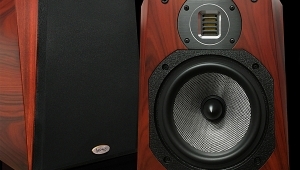 Superficially similar to the now-discontinued TC-50 but taller and narrower, it shares that model's angled front baffle which, in combination with John Bau's unique crossover topology—a fourth-order, Bessel low-pass filter for the woofer coupled with a first-order high-pass filter for the tweeter—gives a time-coherent performance and a flat amplitude response on the listening axis. 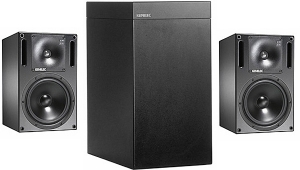 The cabinet's internal volume, however, is twice as large as the older speaker, and—Shock! Horror!—there's a 1.5"-diameter reflex port at the base of the enclosure's rear panel. This port is long—it bends by 90° in the center to avoid hitting the front baffle, and ends up close to the opposite side wall—and tunes the enclosure to the so-called "QB3," or "third-order Quasi-Butterworth" alignment. This gives a good combination of low-frequency extension and not-excessive enclosure size for a drive-unit with a given Qts (total Q), though the tradeoff is poorer transient response compared with a sealed-box alignment. 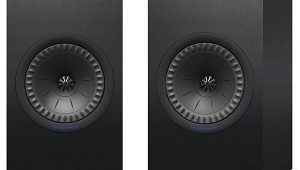 The TC-60's drive-unit complement consists of a 1", double-chambered, cloth-dome tweeter sourced from VIFA and a Peerless polypropylene-coned woofer of nominal 6.5" frame diameter. A major factor in John Bau's choice of these drivers was their high dynamic range. 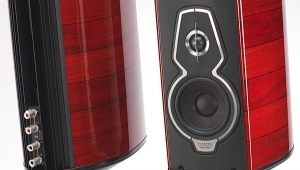 The older TC-50's treble increasingly rolled-off early at high sound-pressure levels, which led some listeners to declare it to sound too rolled-off. The TC-60 is said to maintain its specified tonal balance between input levels of 100mV and 10V, which is excellent dynamic linearity. As with the TC-50 and Angelus, almost all the TC-60's baffle area is covered with a 1"-thick felt blanket. This has a circular hole cut out of it for the woofer and a complicated, chevron-like hole for the tweeter. As well as damping the front baffle's resonant modes, this blanket modifies the drive-unit's radiation patterns in the lower treble. As the grille frame continues the profile of the felt, the TC-60 sounds best auditioned with the grille on. 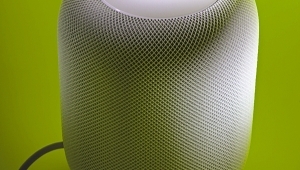 More felt is used internally to minimize reflection of the woofer's sound from the rear wall, and a brace connects the front and rear walls. The crossover, constructed on a printed circuit board attached to the rear wall next to the terminal panel, uses ferrite-cored inductors and plastic-film capacitors. Two sets of five-way binding pots are fitted to allow for bi-wiring, but the internal wiring appears to be modest 18-gauge. 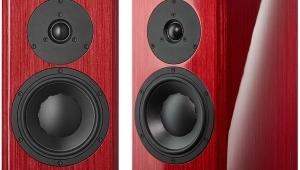 My first audition of the Spicas had been an informal one in the Stereophile listening room, where they were driven by Counterpoint Natural Progression amplifiers. Though the sound was impressive, it was a little too sweet-toned in absolute terms. In my own system, with the TC-60s sitting on 24" stands, I still needed to use small cones to tilt the front of the speaker up a little so that I was sitting on the optimum axis. With room placement also optimized, I sat down to do some serious listening. I was still impressed. Yes, there was still a lack of top-octave air in absolute terms, but the speakers sounded very inviting. The TC-60s also went unexpectedly deep in my room; even the 31.5Hz warble tone on Stereophile's Test CD 2 was surprisingly audible without obvious doubling. At a measured spl of 84dB at the listening position, however, wind noise overlaid with a couple of pipe tones could be heard coming from the flared port when I stood behind the speaker. If I turned up the level, this noise started to be audible in front of the speaker. Still, this is excellent bass extension for a relatively small speaker, and bass guitar and organ pedals were given, if not quite their full weight, enough bass for musical satisfaction. The speakers handled well-recorded rock with aplomb. The Robben Ford and the Blue Line album (GRP/Stretch STD 1102), for example, features some tight-as-a-nut bass guitar playing from Roscoe Beck—check out "You Cut Me to the Bone" for the ultimate hard-driving shuffle. While the TC-60s are still not the speakers of choice to take to a rave, Mr. Beck's gut-busting bass lines under the wah-wah'd lead guitar came over with power aplenty. Only when the synthesizer vamps chords at this song's climax, doubling the bass line an octave down, did the TC-60s fall short—there's only so much bass you can squeeze from two 6" cones! Big-scale orchestral scores—Chesky's new "Gold Series" remastering of Fritz Reiner's 1962 Brahms Symphony 4 performance, for example (Chesky CG906), another classic Chuck Gerhardt/Kenneth Wilkinson production—didn't suffer from sonic anemia. The power range of the orchestra—the upper bass and lower midrange—was given its full measure, though it sounded cleanest if the playback level was kept below 95dB or so. The balance seemed a little laid-back overall, especially when compared with the Dunlavy SC-Is. The sound wasn't pushed forward at the listener; instead, everything hung in space behind the plane of the speakers. At high levels, a bit of a bite did creep into the low treble, accentuating the fizzy edge to the sound of brass instruments. This made the speakers a little unkind to recordings that were already a bit fizzy in the low treble. Earlier I mentioned the Spica's surprisingly deep bass extension. The price to be paid is that the speaker lacks a little in the pace and rhythm department; not a lot, but enough to make some recordings sound a little ponderous. On Eric Clapton's From the Cradle (Reprise 45735-2), the bass guitar on the opening cut, "Blues Before Sunrise," underpins the Elmore James slide riff with solid four-in-the-bar tonics, but their attacks seemed a little slow on the Spicas compared, for example, with the $8000/pair B&W Silver Signatures that the Spicas replaced in my listening room, or the Dunlavy SC-Is that, in turn, followed the Spicas. It was time to reach for my bass-timing test track, "Last Train Home," from Pat Metheny's Still Life (Talking) (Geffen GEFD 24145-2). Steve Rodby's bass line on this track consists of a throbbing ostinato that many reflex speakers just can't keep up with, typically destroying the sense of musical urgency by smearing one eighth-note into the next. The Spica didn't do badly on this test, but I really want more of a sense of pace. But...the soundstage thrown by the Spicas on this atmospheric track was huge, as in occupying a huge space between and behind the speakers, as in inducing a huge goosebump rush in moi, the listener. It wasn't quite as razor's-edge defined as the soundstage offered up by the more-forward-balanced Dunlavy SC-Is, but it wasn't far behind. And did I say it was huge? This is something that is very important to me. When I slump into my listening chair at the end of a hard day's grind at the stone, I want to be enveloped by my music. The Spicas do the virtual space thing in a manner that is unrivaled until you start to get into kilobucks territory. Oh, I forgot to mention coloration. The TC-60 wasn't colored, its midrange sounding natural and open. There was an occasional bit of lower-midrange congestion audible—piano and male voices occasionally sounded a little too warm—but nothing to get too bothered about. 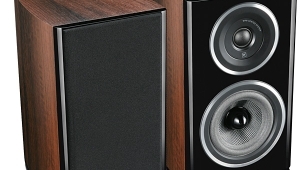 Every audio reviewer lives for the moment when he or she hears true high-end sound quality emanating from affordable components. Which is why I got excited by the Spica TC-60. 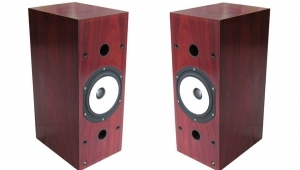 At $800/pair (plus $250 for the excellent stands), these speakers produce a sound that is much better than anyone with only so much to spend has any right to expect. 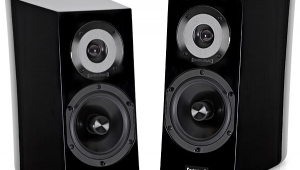 Yes, there are compromises—the bass lacks a bit of pace, there aren't quite the degrees of detail and transparency offered by the similarly priced Dunlavy SC-Is, and you shouldn't choose these speakers if you want to play your music at rave levels in a large room. But within those limits, the TC-60 produces a big, enveloping sound with more bass and space than you'd believe possible at the price. Recommended. 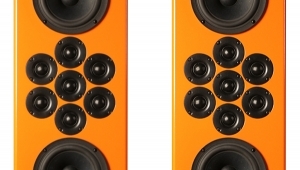 Spica Loudspeakers Division of Parasound Products Inc.